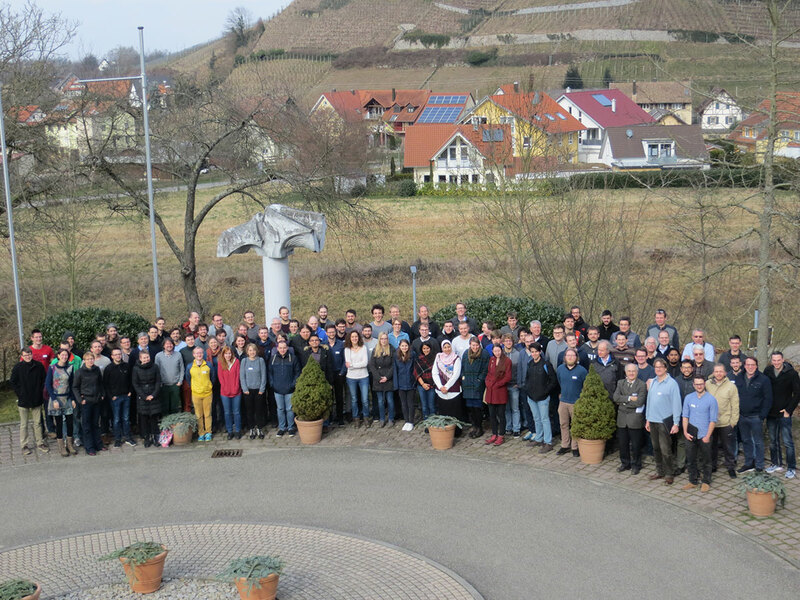 The sixth KSETA Plenary Workshop took place from February 25 to 27, 2019, as usual in the Hotel Vierjahreszeiten in Durbach. All Fellows and Principal Investigators were invited and thus 100 KSETA members took the opportunity to learn more about the research fields of KSETA and to get to know each other. An interesting lecture program was offered on topics like neutrino scattering, new detectors for IceCube, search for axions, galactic winds and much more. 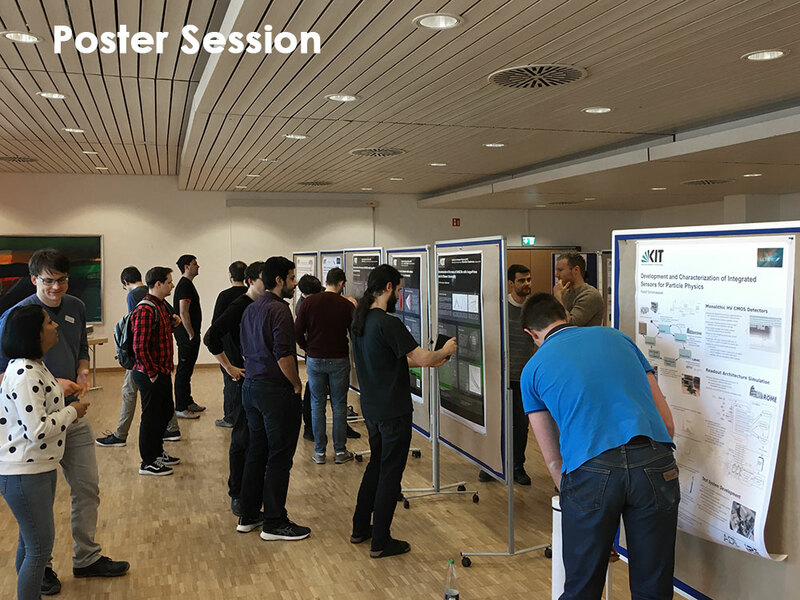 The poster session on Tuesday was once again the liveliest part of the program with some really unusual implementations. Poster prizes were awarded for the third time, this time as shopping vouchers. 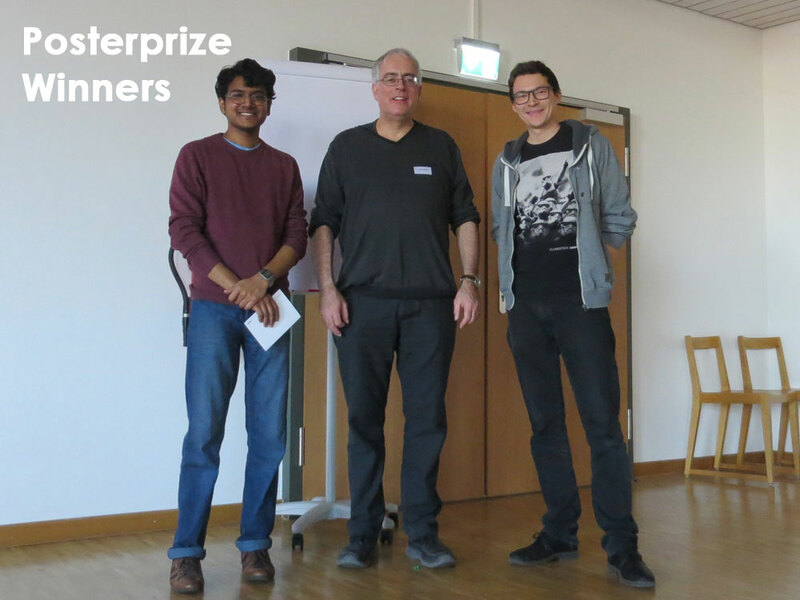 The 2019 winners are Neeraj Amin (1st place) and Maximilian Stadelmaier et al (2nd place). Maximilian's poster is a joint effort and he shares the prize with Steffen Hahn and Marcel Köpke. During the workshop the annual meetings of all Principal Investigators (PIs) and all KSETA Fellows took place. New members of the Executive Board and the Admission Panel were elected at the PIs meeting. The KSETA Fellows elected their new representatives. A good tradition was the convivial get-together on the first evening with the popular wine tasting and this time a cooking course in the hotel kitchen. 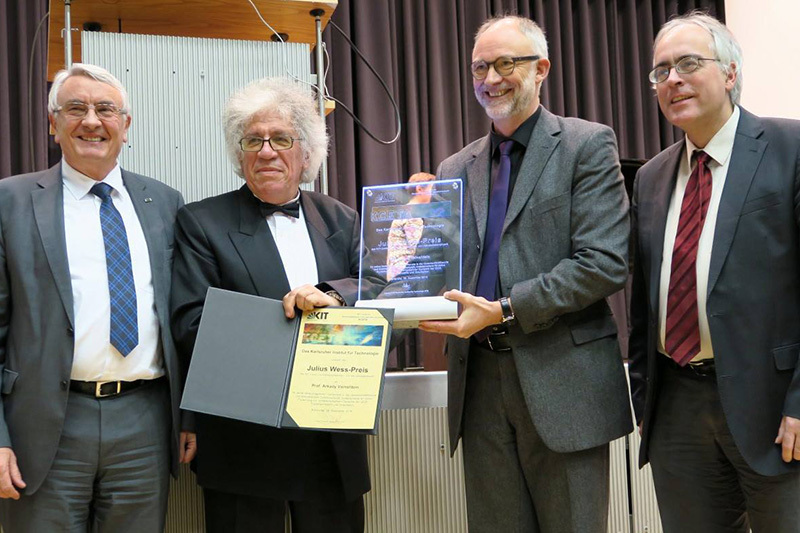 On 20 November 2018, the inauguration of the Helmholtz International Research School for Astroparticle Physics and Enabling Technologies (HIRSAP) took place at the Universidad Nacional de San Martín (UNSAM) in Buenos Aires. At Campus Miguelete, guests and representatives of the two participating universities UNSAM and KIT came together to officially start off the graduate school in a festive event. From Germany Dr. Ilja Bohnet (Research Fellow Matter of the Helmholtz Association), Prof. Thomas Hirth (Vice President for Innovation and International Affairs at KIT), Prof. Johannes Blümer (Head of Division 5 at KIT), Prof. Ralph Engel (Spokesperson of HIRSAP at KIT), and scientists from KIT participated in the event. From Argentina the participants were Jorge Tezón (Manager of Scientific and Technological Development at CONICET), Prof. Carlos Greco (Rector of UNSAM), Prof. Alberto Carlos Frasch (Vice Rector of UNSAM), Prof. Alberto Etchegoyen (Spokesperson of HIRSAP at UNSAM/ITeDA) and scientists from UNSAM. The first PhD students of the school were also on site to present themselves and their research topics in a PhD workshop. In this way, all participants were given the opportunity to gain an overview of the diversity and complementarity of the topics of the doctoral theses and to get to know the doctoral students better. On the German side, the opening ceremony of the HIRSAP already took place in April 2018 at KIT. Prof. Sharipov (Parana University, Curitiba, Brazil) was a guest of the KATRIN Group from November 12-16. Through the KSETA funding of this event, the young scientists had the opportunity for a direct and project-oriented exchange with one of the world's leading experts in this field. a two-part introductory course to his special field "Vacuum Gas Dynamics"
Project work with several KSETA PhD students and KCETA scientists (see photo on the left) to model the gas distribution in the tritium source of KATRIN, especially under the background of the evaluation of the measurement data from the two measurement phases this year. Florian Heizmann, Alexander Marsteller, Fabian Block, K.V., Ferenc Glück, Joachim Wolf, Felix Sharipov, Carsten Röttele. On the picture you can see a true-to-scale section of the jet tube of the KATRIN tritium source and many drawings from the detailed discussion on the white board in the background. The dedication of the Julius Wess Award is linked with a lecture course of the laureates at KIT, open for all students. These lectures find a lively interest and contribute effectively in imparting newest research results to the undergraduate and PhD students of KCETA. The seminar of Prof. Halzen, Wess Awardee 2017, is entitled "Opening a New Window on the Universe from the South Pole" and will take place from 24 to 26 October 2018 at Campus North. This year's destination of the KSETA excursion (September 6 - 7, 2018) was the Dutch Institute for Radio Astronomy ASTRON. 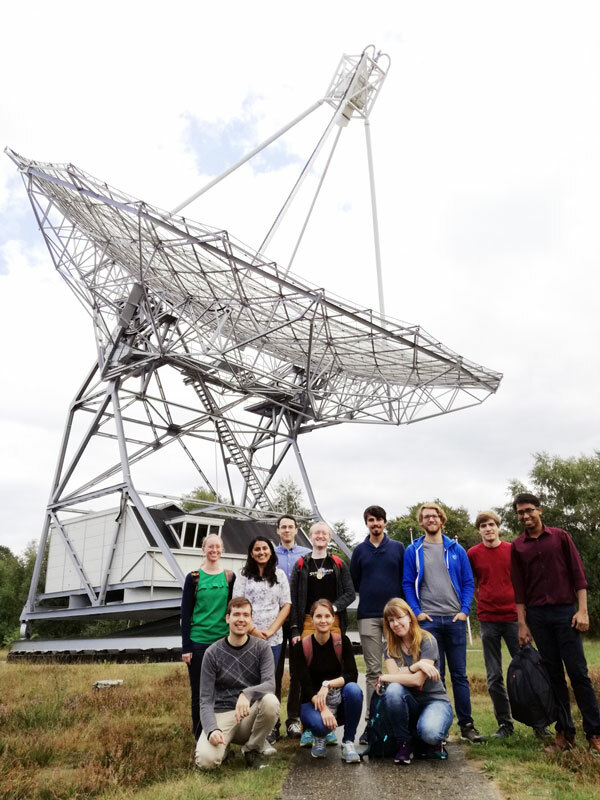 A total of 12 KSETA Fellows visited the radio antenna telescopes: Dwingeloo Telescope, Westerbork Synthesis Radio Telescope and the entire LOFAR experiment. Besides the scientific program, the excursion included a visit to the Westerbork transit camp. 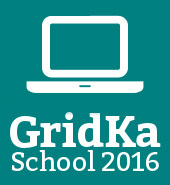 This year’s GridKa School will take place from August 27-31, 2018 at the Karlsruhe Institute of Technology, Germany. It will again impart knowledge using a mixture of plenary talks and hands-on courses focussing on interesting and state-of-the-art topics in workflow management, modern programming and data analytics. Deep Learning, GoLang, Julia, Scientific Python, Jupyter Notebooks, Embedded Programming, Concurrent Programming, GPUs, High Performance Computing, Thrill, Docker, (No)SQL, Pachyderm, HTCondor, Quantum Computing, Security and much more. Please visit our website for more details and https://indico.scc.kit.edu/event/427/ for the agenda and registration. Looking forward to welcome you at GridKa School 2018! 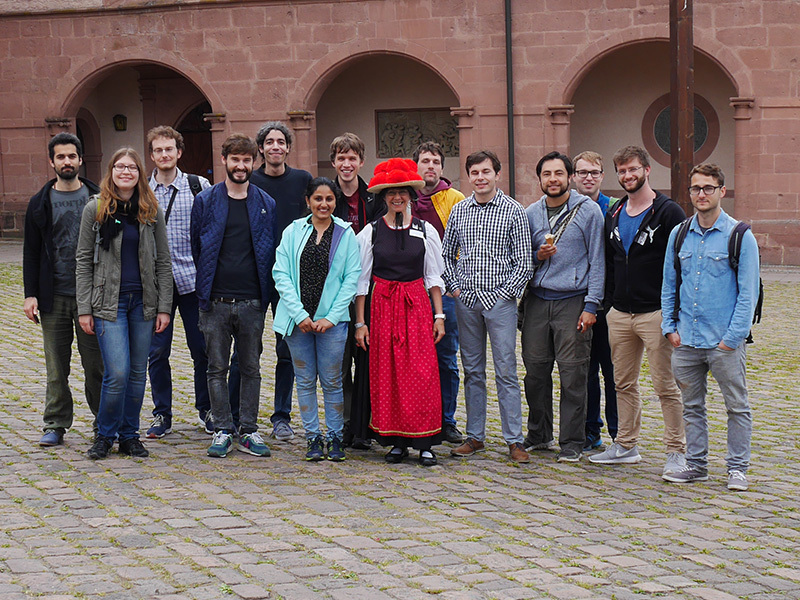 Under the motto "From PhD students for PhD students" the KSETA workshop took place again this year in Freudenstadt. 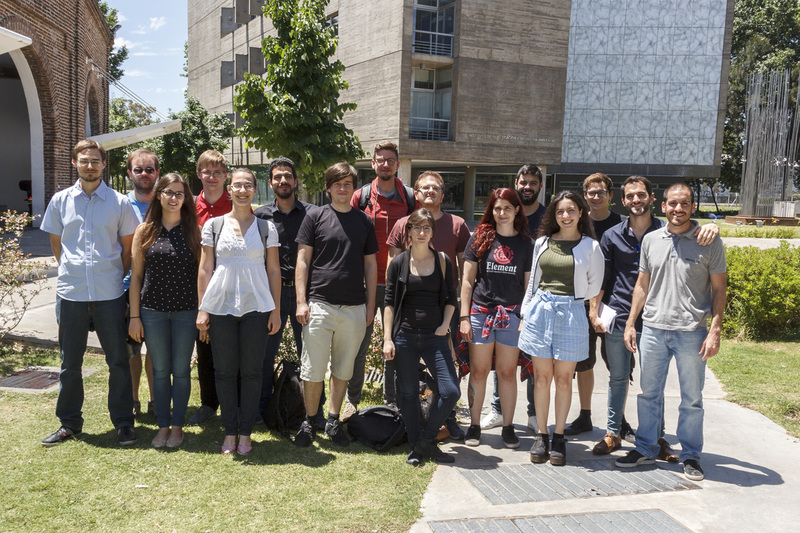 From 2nd to 4th of July, a total of 19 participants from 6 different institutes came together to contribute to the interactive program comprising the data acquisition and processing, programming languages, Feynman graphs and astroparticle physics. Moreover, during the KSETA Alumni evening fellows fruitfully discussed with two young scientists Lenka Tomankova (Ruhr University Bochum) and Bernhard Siebenborn (KIT) "how to stay in science". 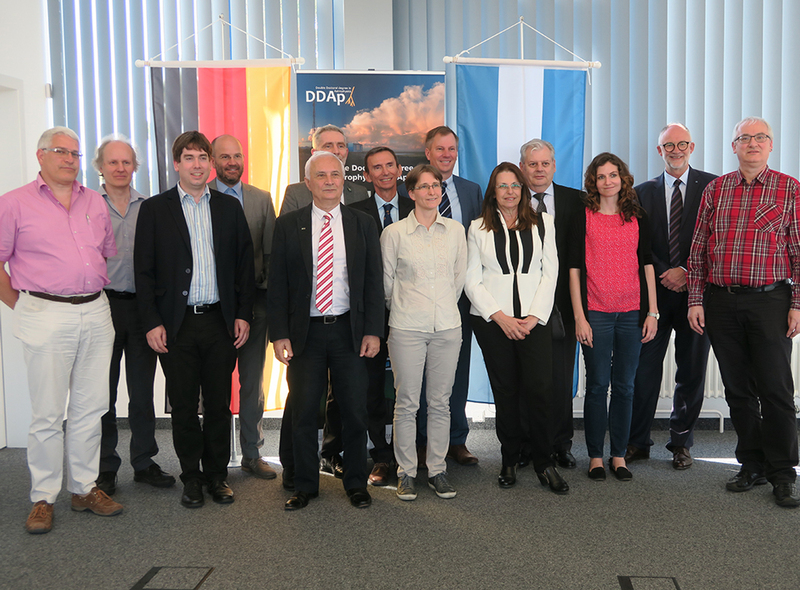 On April 17, 2018 the first kick-off event for the Helmholtz International Research School for Astroparticle Physics and Enabling Technologies (HIRSAP) of the Karlsruhe Institute of Technology (KIT) and the Universidad Nacional de San Martín (UNSAM) in Buenos Aires (Argentina) took place at KIT. It started with welcome talks by KIT Vice President Research Prof. Oliver Kraft and by UNSAM Vice Rector Prof. Alberto Carlos Frasch followed by introductory talks by the KIT head of division 5, Prof. Johannes Blümer, by Spokesperson of HIRSAP at KIT Prof. Ralph Engel, and by Spokesperson of HIRSAP at UNSAM/ITeDA Prof. Alberto Etchegoyen from Argentina. Two PhD students of the existing program Double Doctoral degree in Astrophysics (DDAp), Isabel Astrid Goos (CNEA/IB, Bariloche), and David Schmidt (KIT), presented some special insights in their impressions and experiences in the cotutelle program. Finally the keynote speaker Dr. Walter Winter from DESY gave a very interesting talk on “Multi-Messenger Astroparticle Physics”. The aim of the Helmholtz International Research School for Astroparticle Physics and Enabling Technologies is the development and application of cutting-edge particle detection techniques and corresponding analysis methods in high-energy astroparticle physics. The graduate school concentrates on the investigation of ultra-high-energy cosmic rays. It has an interdisciplinary character by bringing together leading physicists and engineers of the fields of particle detection technologies, data analysis, and model building. 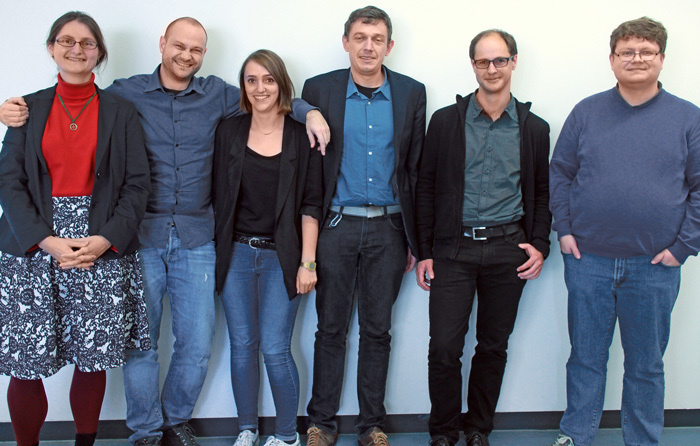 The school builds on a long-standing and very fruitful collaboration between the partner institutes and the existing cotutelle program Double Doctoral degree in Astrophysics (DDAp). 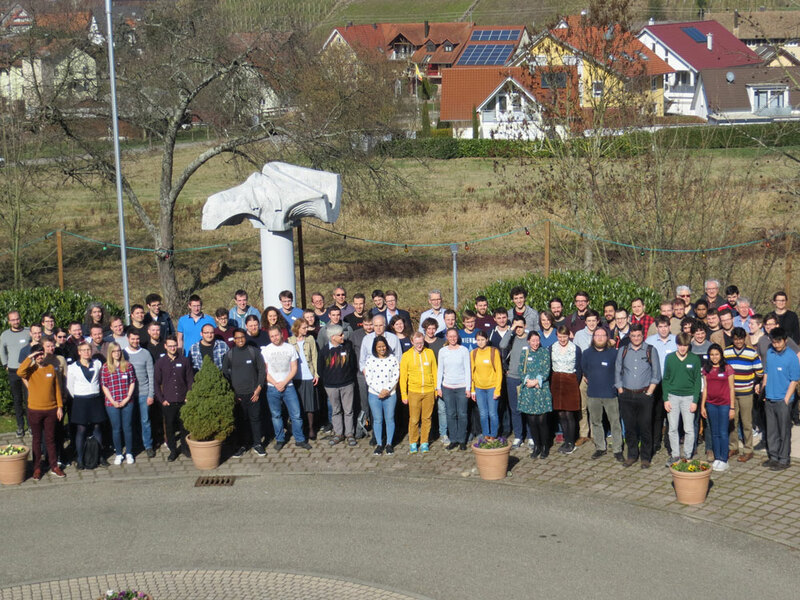 The fifth KSETA Plenary Workshop took place from February 26 to 28, 2018, again at Hotel Vierjahreszeiten in Durbach. All Fellows and Principal Investigators were invited to participate and 113 members of KSETA took this opportunity to learn more about the KSETA research fields and to get to know each other. They enjoyed an interesting program with talks of external speakers and doctoral fellows about IceCube, AMS, the LHC, low temperature micro calimeters, AugerPrime and CMS. 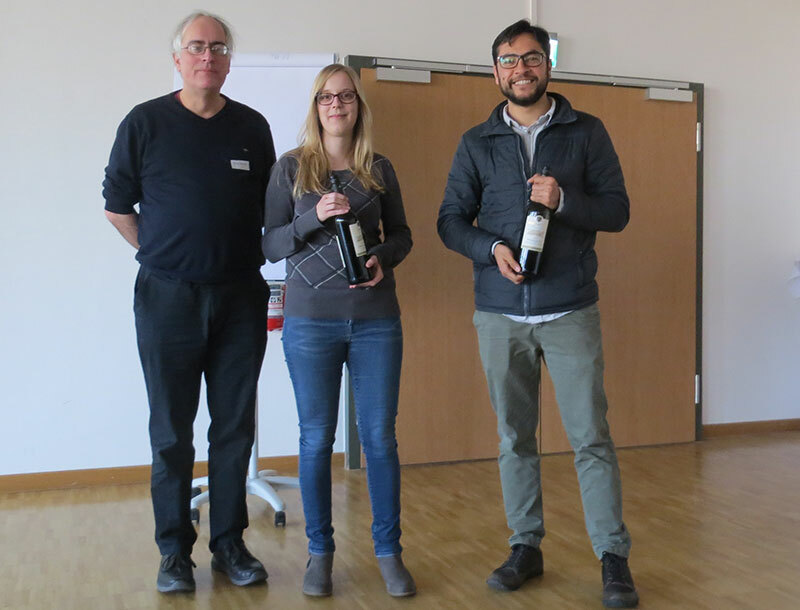 Again the poster session, performed by KSETA Fellows, was an essential part of the program and for the second time the Fellows awarded a poster prize: the 2018 winners were Luis Ardila and Denise Müller. In the frame of the workshop also the annual assemblies of all Principal Investigators and all KSETA Fellows took place. During the meeting of the PIs new members of the Executive Board and the Admission Panel were elected. The doctoral fellows elected new Representatives. A good tradition was the social event on the first evening with the popular wine tasting and a game evening which was offered in parallel. 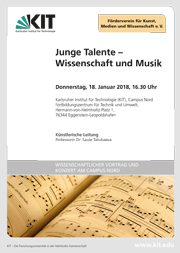 January 18, 2018 – Event in the series "Junge Talente – Wissenschaft und Musik"
KSETA PhD student Andreas Pargner talked about "The Dark Side of our Universe"
The 15 year series "Young Talents - Science and Music" is organized by the Karlsruhe Institute of Technology (KIT) in cooperation with the Förderverein für Kunst, Medien und Wissenschaft e.V. (Friends of the Arts, Media and Science). The special thing about it: Eleven times a year, young KIT scientists give understandable lectures to provide insights into their research and then young, top-class musicians perform classical music. About 95% of the universe is hidden to us. Starting from what we know, the standard model of particle physics and gravity, we approach the great unknown part of our cosmos. Andreas Pargner explained the concept of Dark Matter and why we urgently need it in our universe, what this invisible form of matter could be and how we try to find it. The musical part was performed by the young Chinese pianist Xue Huang, who is studying at the Hochschule für Musik in Karlsruhe. She played works by Antonio Soler, Peter Ilyich Tchaikovsky and Enrique Granados. 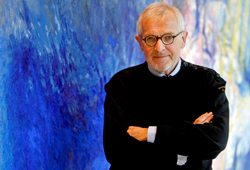 Prof. Robert Klanner, professor at University Hamburg and Julius Wess awardee 2016, will give a seminar on the basic concepts of Si-sensors, focussing on the different types of Si-detectors, bulk and surface radiation damage, and the performance, characterization and open questions of silicon photomultipliers. From November 2 – 10, 2017 we offered a KSETA course with our guest scientists Prof. Dr. Ricardo Piegaia and Dr. Dario Rodrigues from CONICET/UBA/UNSAM in Buenos Aires (Argentina). 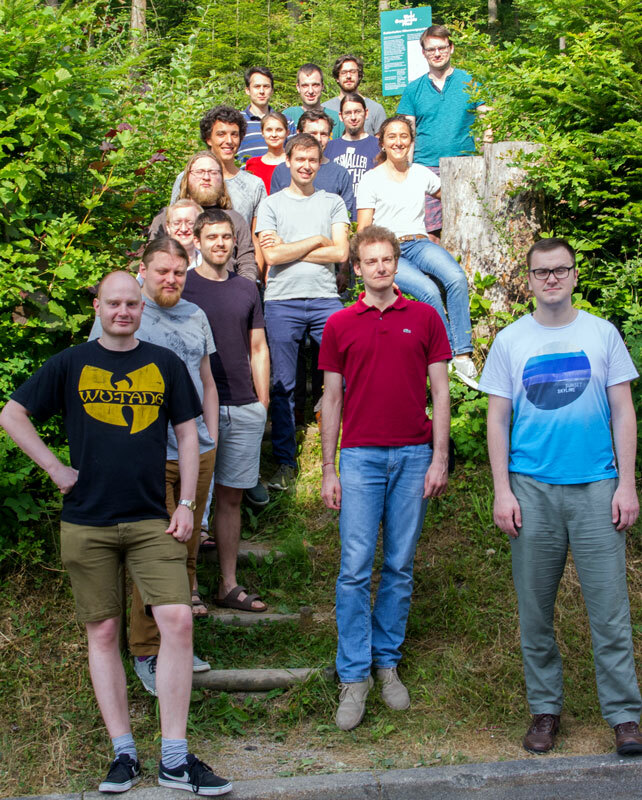 Thes course offered a practical approach to those principles and practices of statistics that are most relevant for data analysis in particle and astroparticle physics. 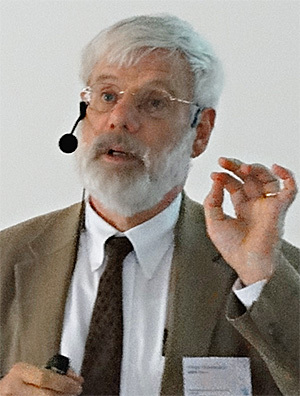 The lectures covered parameter estimation, confidence intervals and limits, profile likelihoods, statistical tests for goodness-of-fit, application of hypothesis testing to searches for new phenomena, treatment of systematic uncertainties, and a critical discussion and comparison between the frequentist and the Bayesian approaches to these subjects. Throughout, real-world examples were used to illustrate the practical application of the ideas. Each session consisted of a 1-hour lecture followed by one hour of practical computing, with exercises based on that day's lecture. In order to follow the hands-on sessions, participants needed to bring their own laptops and have a basic prior knowledge of ROOT and C++. No previous experience with more recent ROOT-based statistics tools like RooFit and RooStats was assumed. This course was part of the Double Doctoral Degree in Astrophysics between UNSAM and KIT. The Karlsruhe School of Elementary Particle and Astroparticle Physics: Science and Technology (KSETA) was funded in 2012 in the frame of the Excellence Initiative II. The first funding period ended in October 2017. 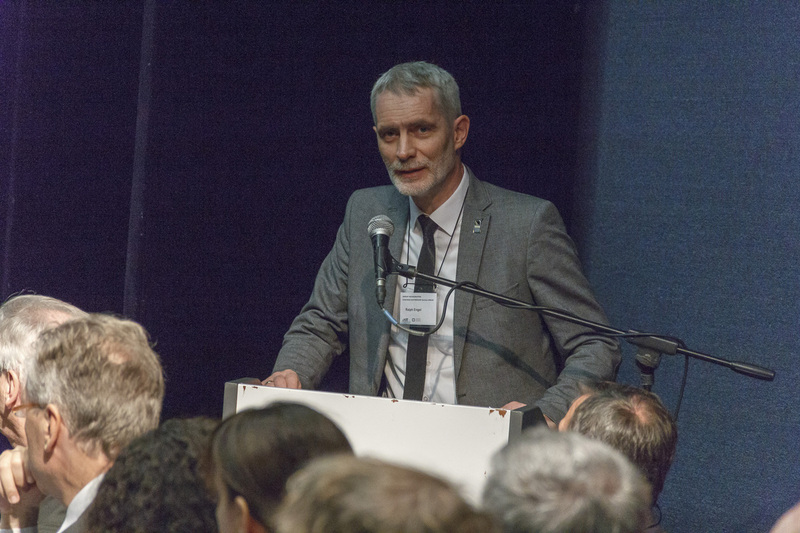 This was the opportunity to celebrate the success of the first five years with a symposium. 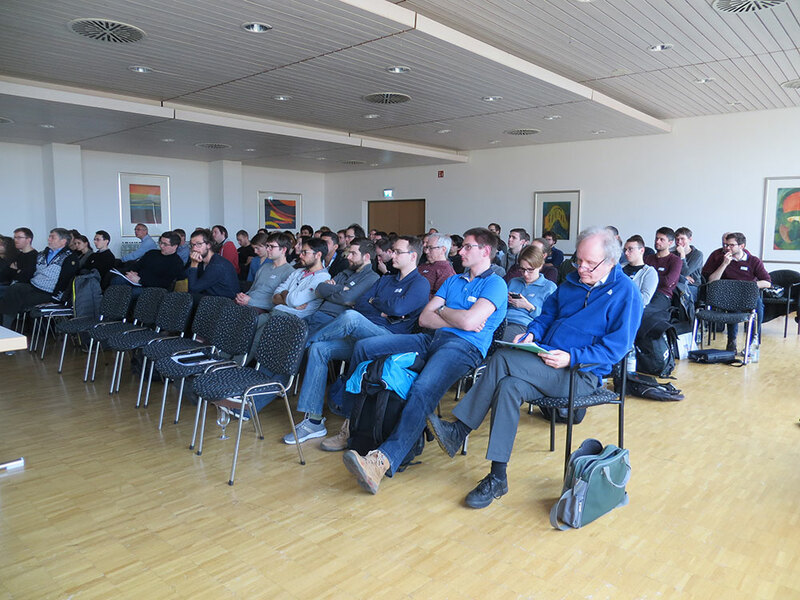 The first part of the event was a scientific symposium which consisted of six talks by the KSETA Alumni Anne Zilles (IAP, Paris), Alessio Porcelli (JGU Mainz), Holger Kluck (HEPHY, Austria), Wolfgang Hollik (DESY), Benjamin Schmidt (LBNL), and Stefanie Falk. We continued with a special colloquium. 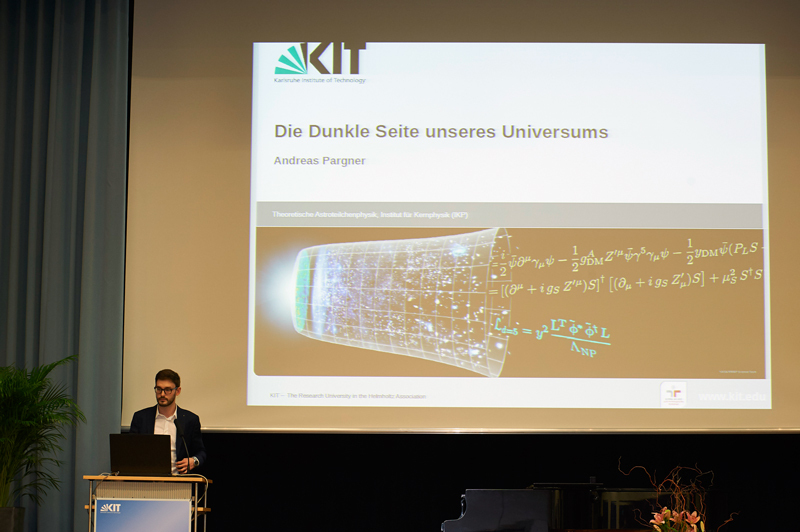 KSETA spokesperson Prof. Ulrich Nierste (TTP) gave a KSETA overview followed by two welcome addresses of KIT Vice President Research Prof. Oliver Kraft and Prof. Johannes Blümer (Head of Division Physics and Mathematics). Special guest and Julius Wess Awardee of 2009 Prof. John Ellis gave a talk on "Particle Physics Today, Tomorrow and Beyond". Both lectures were part of the Double Doctoral Degree in Astrophysics between UNSAM and KIT. 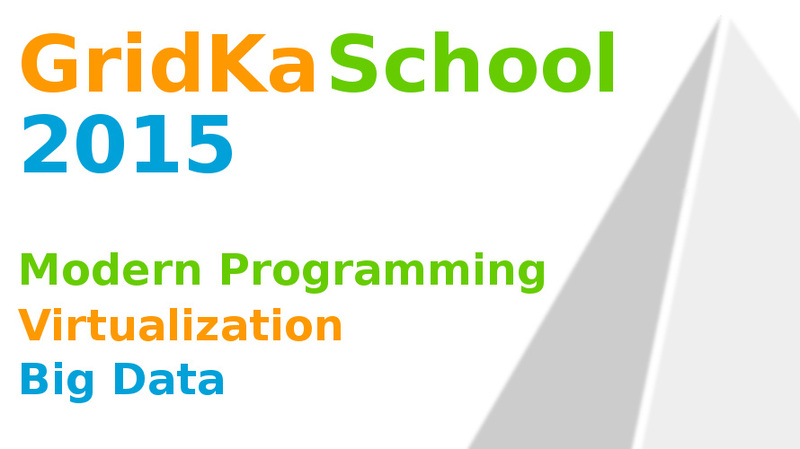 2017 GridKa School "make science && run"
This year’s school will again impart knowledge using a mixture of plenary talks and hands-on courses focussing on interesting and state-of-the-art topics in cluster orchestration, modern programming and data analytics. For example: Deep Learning, GoLang, Erlang, Scientific Python, Jupyter Notebooks, Concurrent Programming, GPUs, High Performance Computing, Docker, (No)SQL, Apache Mesos, Kubernetes, Apache Spark/Hadoop, HTCondor, Quantum Computing and much more. Please visit our web site for more details and our indico site for the preliminary agenda and registration. The Fellows of KSETA participated in an excursion to DESY-Hamburg. 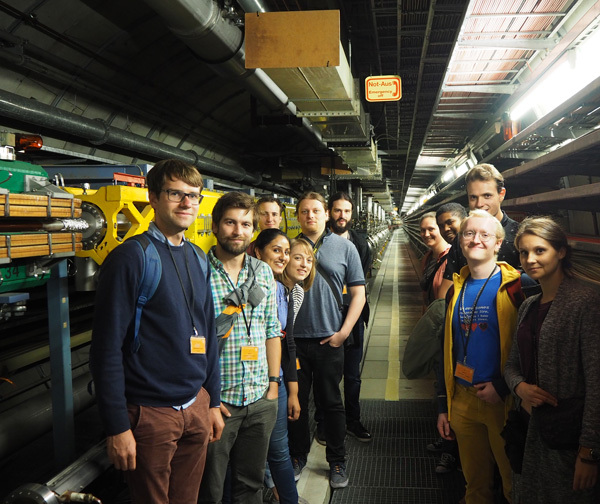 One of the PhD students at DESY took the Fellows for a guided tour which lasted for three hours. The tour started with a talk from the guide explaining the different accelerator experiments at DESY. This was followed by a visit to the HERA tunnel, where the Fellows could walk inside the tunnel and see the different components of the accelerator. The remaining parts of the HERA-B detector were also seen. Following this the Fellows visited the experimental hall PETRA. The day ended with a social evening including dinner at a local restaurant. The KSETA Doctoral Workshop of the year 2017 took place in Freudenstadt in July. The motto of the workshop was “From doctoral students, for doctoral students” and it aimed at providing a platform for Fellows from different institutes to interact with each other. The workshop consisted of talks and tutorials from KSETA Fellows, with the aim to help out other Fellows. Alumni from KSETA were also invited to talk with the Fellows about job opportunities after PhD. The Fellows also participated in social activities like hiking through the forest and visiting the local bath. Prof. Robert Klanner, University of Hamburg and DESY, was chosen to receive the Julius Wess Award 2016. The fourth KSETA Plenary Workshop took place at the Hotel Vierjahreszeiten in Durbach from February 13 to 15, 2017. All Fellows and Principal Investigators were invited to participate and about 120 members of KSETA took this opportunity to learn more about the research fields in KSETA and get to know each other. 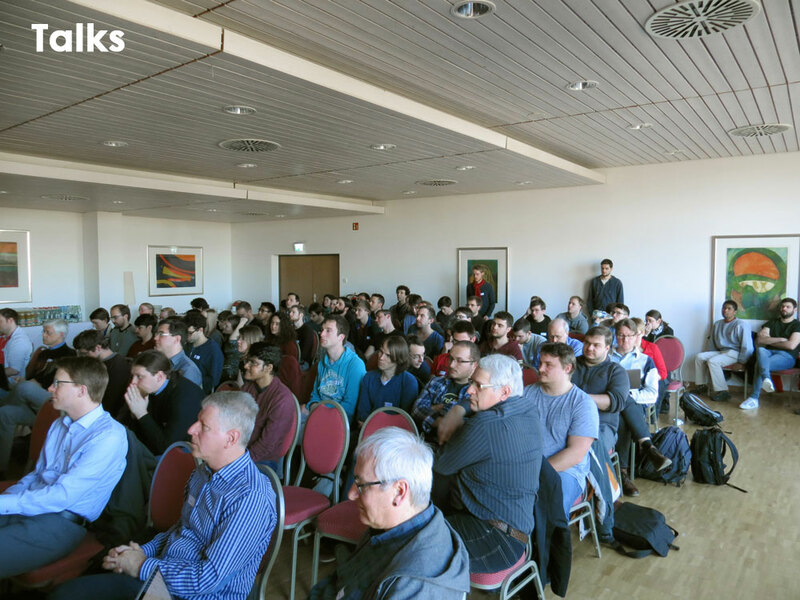 They enjoyed an interesting program with talks from external speakers and doctoral fellows, which covered topics from Dark Matter over Gravitational Waves to Data Center for Seismology. Just like last year one part of this program was the very successful poster session performed by KSETA Fellows. 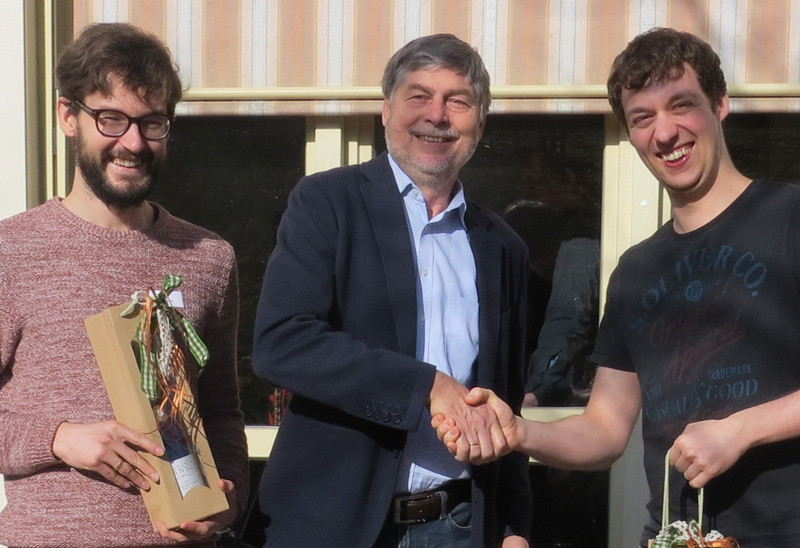 For the first time the Fellows themselves awarded a poster prize and the winners are Andreas Pargner and Thomas Keck. In the frame of the workshop also the annual assemblies of all Principal Investigators and all KSETA Fellows took place. During the meeting of the PIs new members of the Executive Board and the Admission Panel were elected. 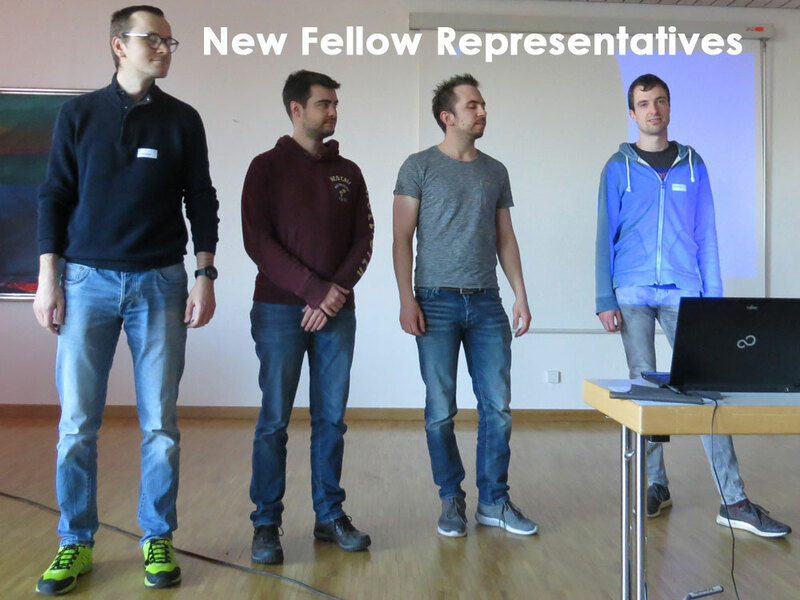 The doctoral fellows elected new representatives. A good tradition is a social event on the first evening. 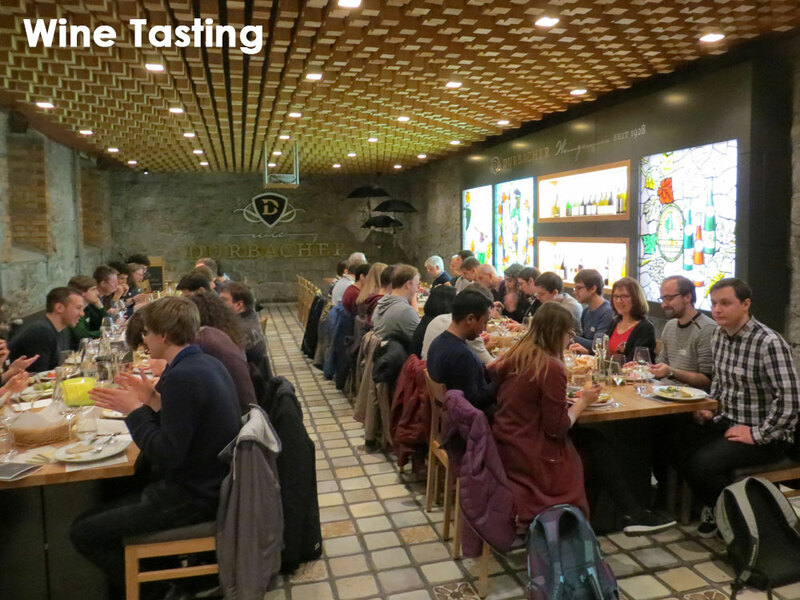 Due to the enthusiasm about the wine tasting last year, it was again organized this year. A game evening was offered in parallel. 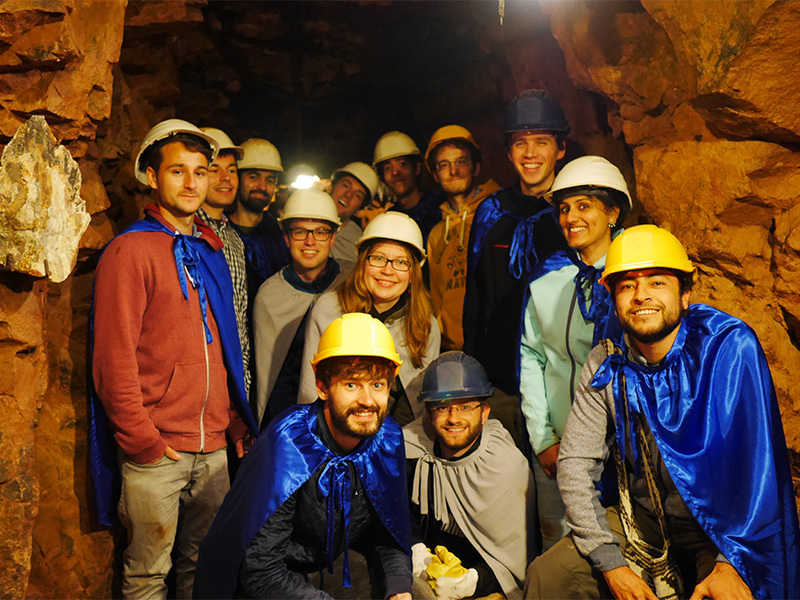 On September 5 and 6, 18 KSETA doctoral students visited the Double Chooz experiment. This serves to investigate the neutrino mixing angle Theta_13 and is constructed on the site of the Chooz nuclear power plant near the French-Belgian border. 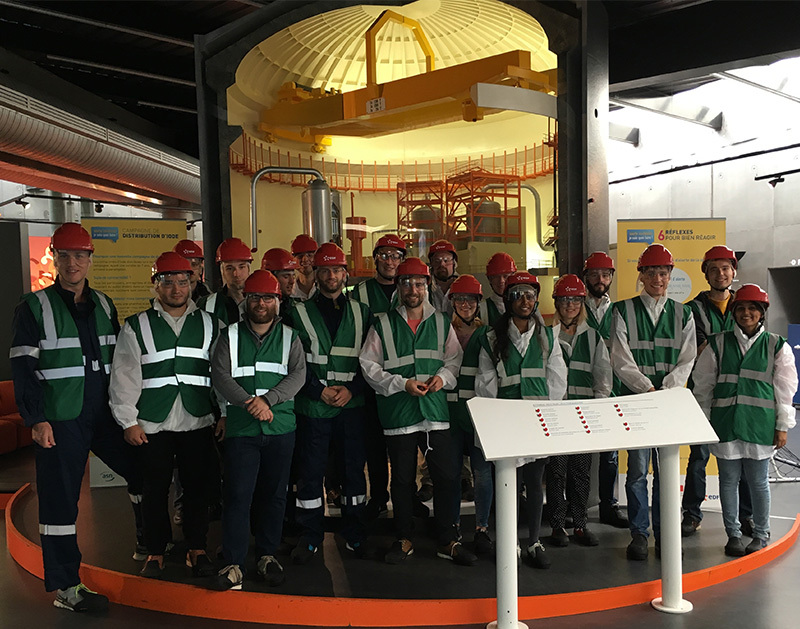 During a tour of the visitor centre followed by a guided tour of the power plant site, the participants first learned something about how the nuclear power plant works and how it operates. The Chooz nuclear power plant generates the highest net output of all nuclear power plants worldwide. Impressive for the doctoral students were the perceptible vibrations of the plant's generator, which runs under full load and weighs several tons. 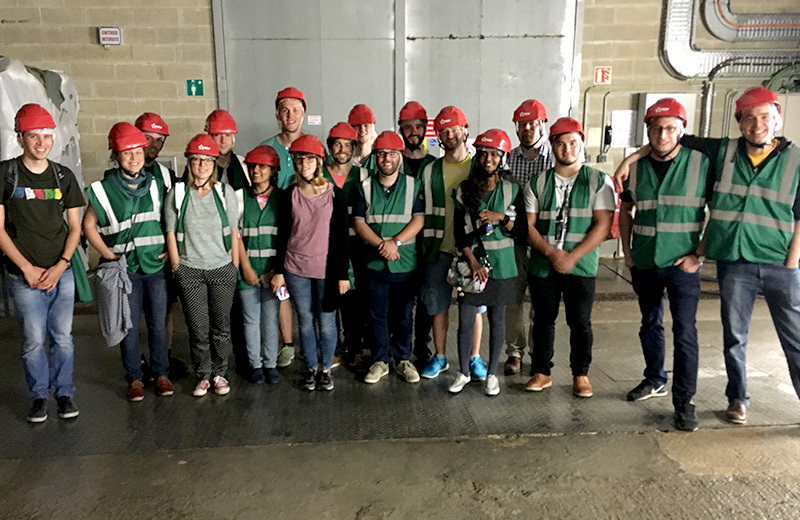 After an introductory lecture on the Double Chooz experiment, the participants went to the underground laboratory of the proximity detector on the site of the power plant. Since the detector was taking data, the dimensions under the shields could only be guessed. Nevertheless, the laboratory offered interesting insights and the participants could ask many questions before they went back to Karlsruhe. Dr. Silvia Mollerach (CONICET, Centro Atómico Bariloche, and Universidad Nacional de San Martín, UNSAM, Argentina) gave a KSETA Seminar on Statistical Methods for Astroparticle Physics. 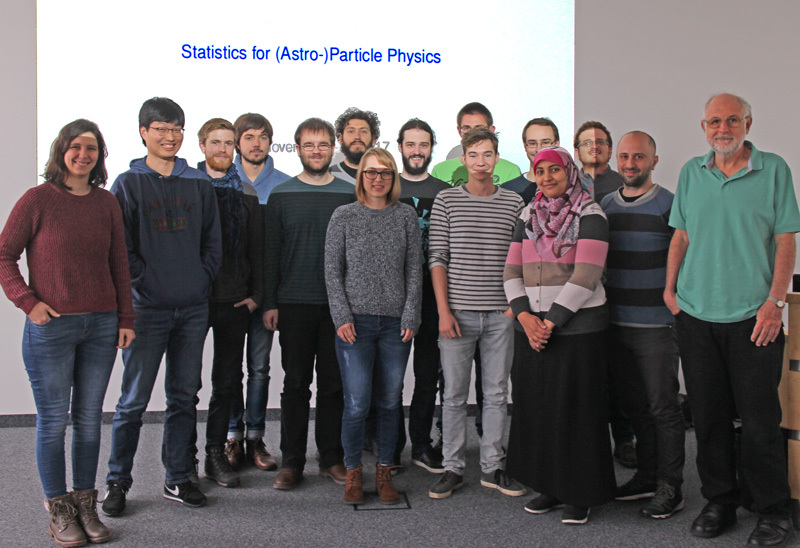 The course covered different statistical methods used to analyse data in astroparticle physics, including the simulation and comparison of measurements to theoretical models. Some basic statistical topics like the concept of probabilities, probability distributions, the calculation of expectation values and higher moments, and the determination of uncertainties as well as correlations were reviewed. More advanced topics relevant to data analyses and statistical inference were discussed. Among these were fitting appropriate models to data, estimating the goodness of fit, testing hypotheses and the construction of confidence intervals. This also included a discussion of the look-elsewhere-effect and the cosmic variance. To better explore these topics, the study of anisotropies in the cosmic rays distribution was used as examples, including large scale anisotropies, clustering studies, and correlation with possible source populations. This seminar was part of the KSETA Topical Courses as well as of the Double Doctoral Degree in Astrophysics between UNSAM and KIT. 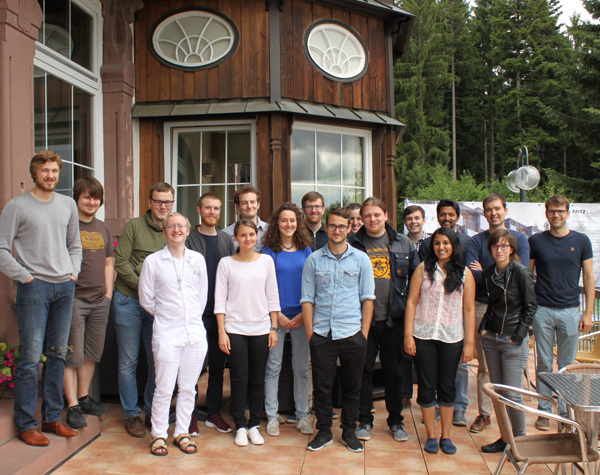 2016 GridKa School "Data Science on Modern Architectures"
As in the past years, the KSETA Doctoral Workshop took place in Freudenstadt in July. Broader - Get an comprehensible insight into PhD projects of KSETA colleagues and discuss links to your own project in small groups. Deeper - Learn more about a specific topic within the scope of KSETA in plenary talks prepared by fellows. Better - Get to know alumni now working for companies and ask them about employee's life in industry. Improve your scientific writing skills in a writing workshop. Please find more informationen on the Indico Website. 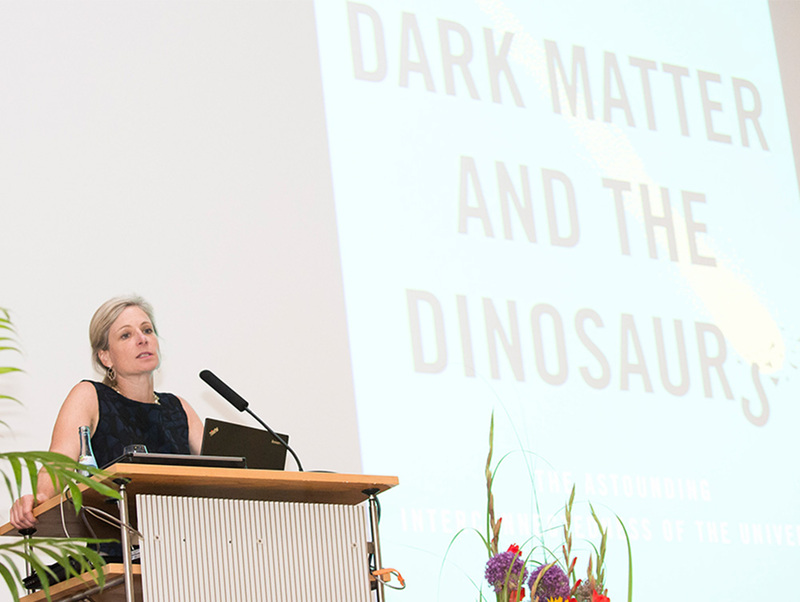 Lisa Randall, professor at Harvard University, was chosen to receive the Julius Wess Award 2015. She received the prize for her pioneering work on theories beyond the Standard Model, in particular the unified description of basic physical forces in models with extra spatial dimensions. On July 7 and 8, 2016 she gave two lectures at KIT. 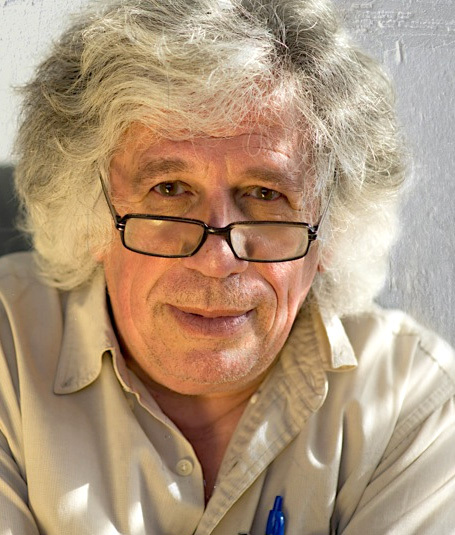 Prof. Esteban Roulet (CONICET, Centro Atómico Bariloche, and Universidad Nacional de San Martín, UNSAM, Argentina) gave a KSETA Seminar on Neutrino Astrophysics from July 4 – 15, 2016. High energy astrophysical neutrinos. Galactic and extragalactic sources. Icecube results. Neutrinos and cosmology: relic neutrinos, nucleosynthesis and neutrinos. Leptogenesis. 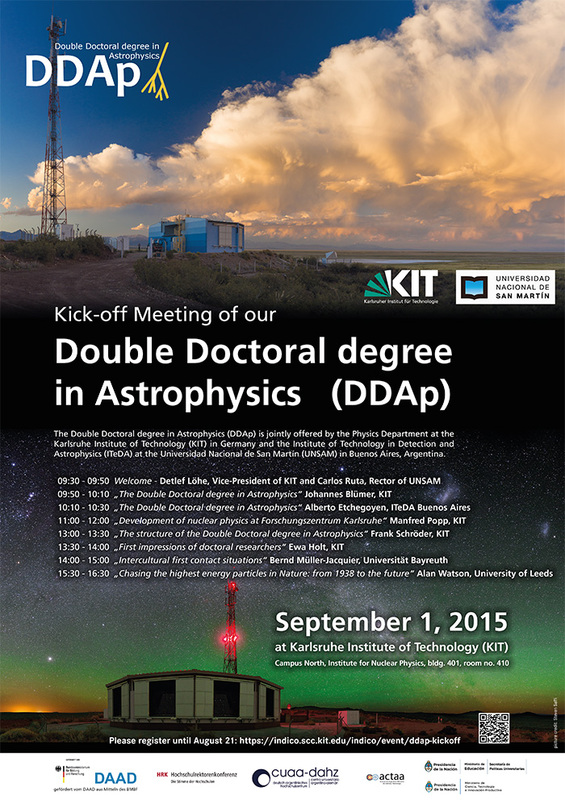 This seminar was part of the Double Doctoral Degree in Astrophysics between UNSAM and KIT. 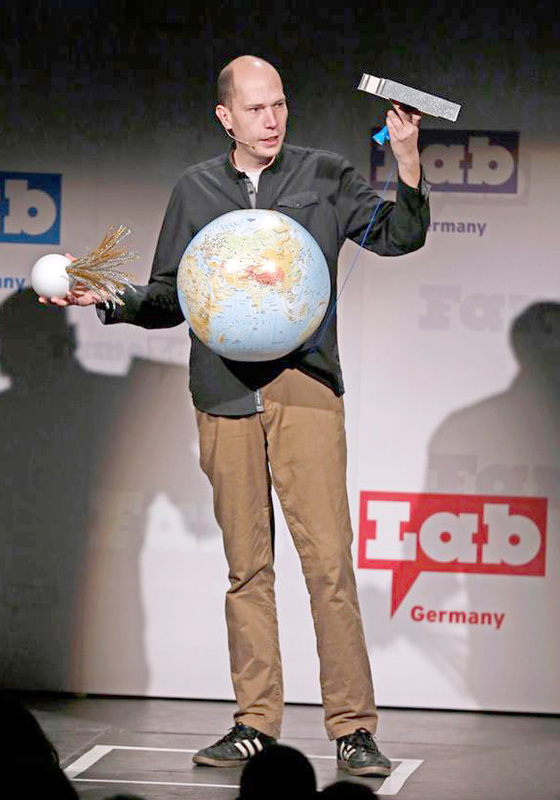 Master student Thomas Huber (IKP), member of the cosmic ray group, took his audience into the world of physics and explained within only three minutes, what cosmic rays are about. Using props limited to what he could carry on stage, he talked about the fascination of cosmic rays, why they are hard to detect and how a telescope attached to the space station ISS is supposed to find out more about them from 2017 on. 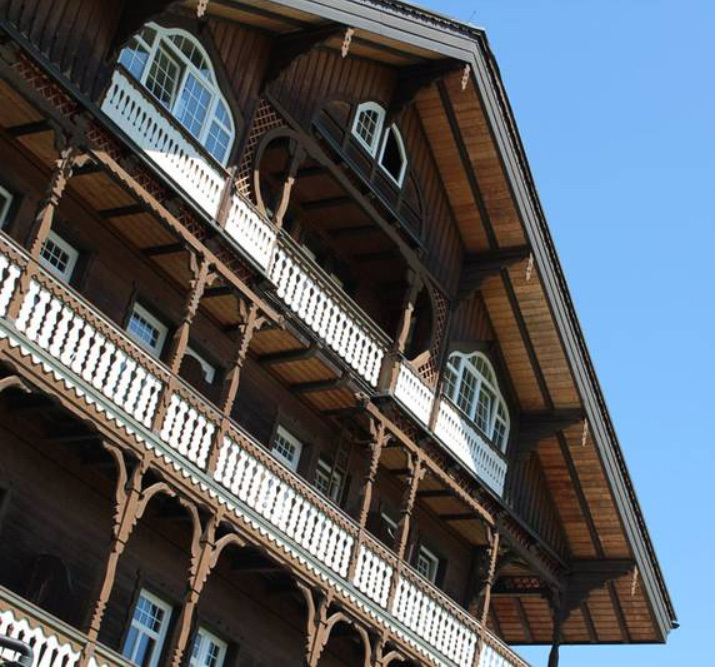 The third KSETA Plenary Workshop took place from February 22 to 24, 2016 at Hotel Vierjahreszeiten in Durbach, just like in the years before. All Fellows and Principal Investigators were invited to participate in the plenary workshop of the whole school. The aim of the workshop was to learn more about all the research fields in KSETA and to strenghten cooperation and team building. On January 27, 2016 Prof. L. Biermann (MPI for Radio Astronomy, Bonn; Department of Physics, KIT; Department of Physics, University of Alabama; Department of Physics and Astr., University of Bonn) gave a KSETA Course at KIT campus north. He talked about different aspects of Dark Matter and Dark Energy. Carl Haber from Lawrence Berkeley National Laboratory, USA, gave a special course on silicon detectors at KIT in October. More information on the content is available as pdf. 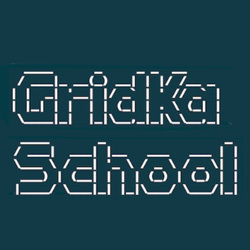 The international GridKa School is one of the leading summer schools for advanced computing techniques in Europe. The school is intended for graduate and PhD students as well as postdocs, who have to program their own code, analyze large amounts of data, or keep care of their computing infrastructure. Topics and practical tutorials will cover efficient and parallel programming, various data analysis tools, storage and database technologies, virtualization techniques and infrastructure management. 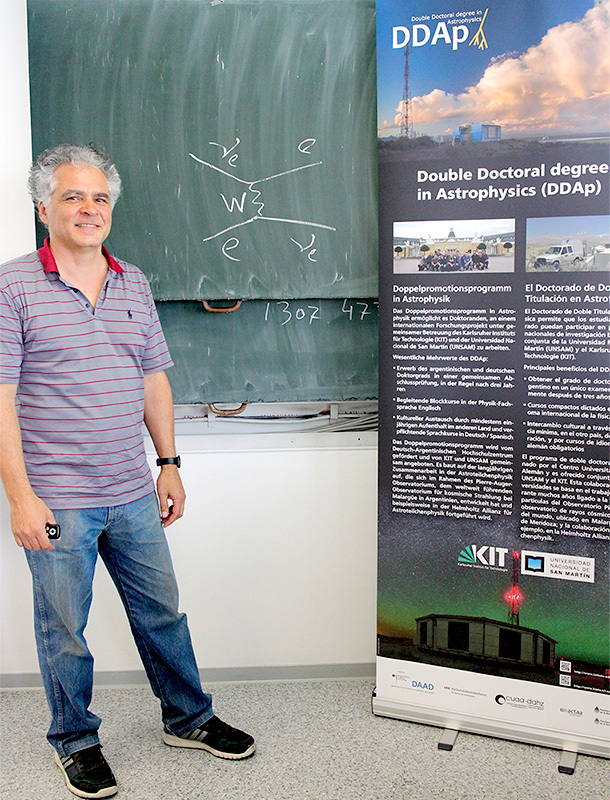 The Double Doctoral degree in Astrophysics (DDAp) is jointly offered by the Physics Department at the Karlsruhe Institute of Technology (KIT) in Germany and the Institute of Technology in Detection and Astrophysics (ITeDA) at the Universidad Nacional de San Martín (UNSAM) in Buenos Aires, Argentina. The Kick-off Meeting will take place on September 1, 2015 at Karlsruhe Institute of Technology (KIT), Campus North, Institute for Nuclear Physics, bldg. 401, room no. 410. 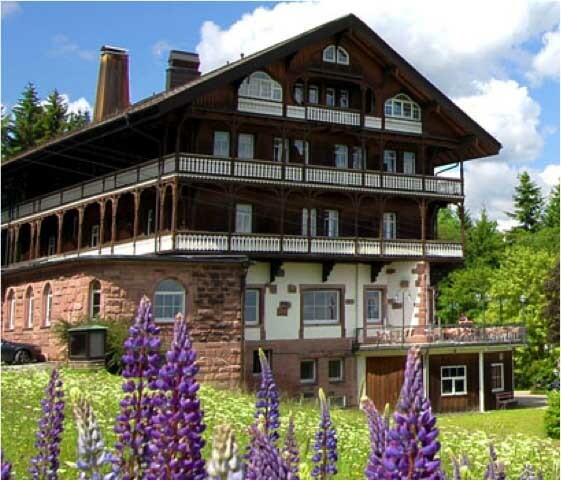 The next KSETA Doctoral Workshop will take place from July 6 to 8, 2015 at Waldhotel Zollernblick in Freudenstadt, located in the Black Forest. Registration is open until May 31. On the program there are tutorials by PhDs which can be useful for other PhDs, invited talks from external speakers with topics ranging from soft-skills to scientific themes, and social activities. Please visit our indico-website for details. 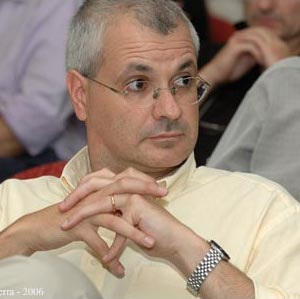 From June 23 - July 10, 2015 Prof. Dr. Arkady Vainshtein (Univ. 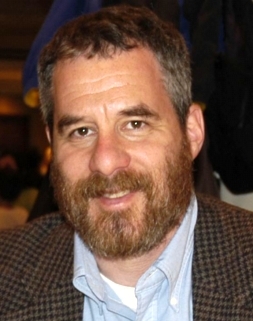 of Minnesota, Minneapolis, USA), the Julius Wess Laureate 2014, gave a series of lectures at KIT on „Instantons and Supersymmetry“. He introduced the notion of instanton and related calculus in non-abelian gauge theories. Starting with quantum mechanical examples, he moved to QCD, and then to supersymmetric gauge theories. Applications to perturbative and nonperturbative quantum effects were reviewed. Please find the course materials here. 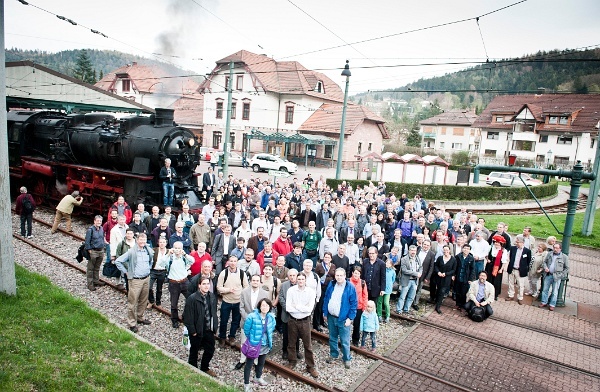 The second KSETA Plenary Workshop took place on March 4-6, 2015 at Hotel Vierjahreszeiten in Durbach. All Fellows and Principal Investigators were cordially invited to participate in the second plenary workshop of the whole school. The aim of the workshop was to learn more about all the research fields in KSETA and to strenghten cooperation and team building. KIT im Rathaus: "News from the world of the smallest particles"
In the series "KIT im Rathaus", the Lord Mayor of Karlsruhe and the President of KIT invited to an event on January 20, 2015 in the Bürgersaal in the Karlsruhe City Hall on the topic "News from the World of the Smallest Particles". The citizens of Karlsruhe found the research in particle and astroparticle physics so exciting that they flocked to the city hall and set a new visitor record for the series "KIT im Rathaus". "Introduction of the KIT Center for Elementary Particles and Astroparticle Physics"
"Neutrinos on the scale of KATRIN"
"The discovery of the Higgs particle or how particles get their mass"
"How elementary particle physics algorithms can save tens of millions"
All presentations have been recorded and are online. In December KSETA offers two workshops on topics in the field of equal opportunity: "Durchsetzung mal anders - als Frau überzeugen" (1. + 12. December) and "Selbstmanagement zwischen Familie und Beruf" (15. + 16. December). Both workshops will be given by Tina Christiansen and will take place at KIT Campus South, building 30.28, Seminarraum 1. Course language will be German. More information can be found on the KSETA Course pages. 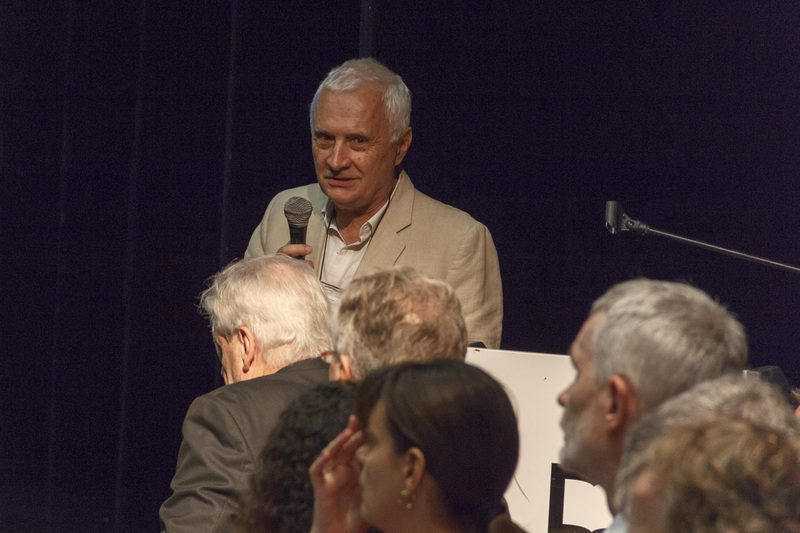 The Julius Wess Award 2014 was dedicated to Prof. Dr. Arkady Vainshtein, who holds the Gloria-Lubkin-professorship at University of Minnesota. 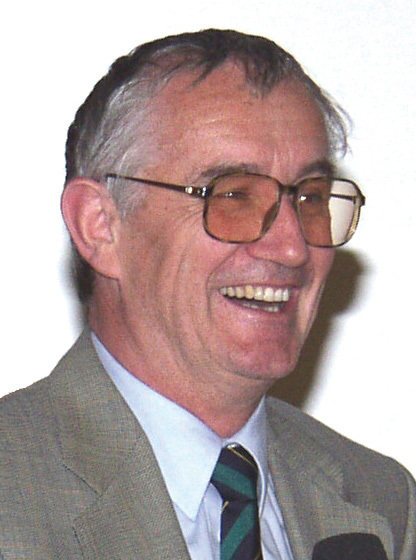 Arkady Vainshtein received the award as one of the most influential theoretical particle physicists of the second half of the 20th century. From October 27 to November 7, 2014, Prof. Gustavo Esteban Romero of UNLP and UNSAM, Buenos Aires, Argentinia will come to KIT. He will give lectures in KSETA on "Black hole astrophysics" in the context of the "Double Doctoral Degree Program in Astrophysics DDAp (KIT–UNSAM)". The lectures will take place each morning during these two weeks on KIT Campus North from 10:45 until 12:15 h, building 425, room 206. This series of lectures is a self-contained and intensive course devoted to black holes and related astrophysics. The first 3 lectures introduce concepts of space-time, general relativity, and black hole exact solutions of Einstein's field equations. The fourth lecture will be more interactive and devoted to discussions of open issues such as alternative black hole theories, mimickers, black hole information paradox and current speculations about the nature of black holes. The next set of 3 lectures will cover topics of black hole astrophysics including accretion, black hole coronae, and relativistic jets. Then, as before, a discussion will be offered on current issues of astrophysics, in particular related to black hole formation and evidence of black hole existence. The last two lectures will cover active galactic nuclei, microquasars, and gamma-ray bursts. Please find the presentations here. Oct 24: "Search for ultra-high energy Neutrinos with the ANITA experiment"
Nov 10: "Detection of high-energy cosmic rays with the ANITA experiment"
Nov 12: "Measurement of radio emission from particle cascades in the lab - the SLAC T-510 experiment"
- Lectures given by invited speakers. - Lectures by our doctoral students on their own field of work, which serve the exchange of information among the doctoral students and the various working groups of the Research Training Group, as well as lecture training. The KSETA Doctoral Workshop (July 21–23, 2014) allows interested KSETA fellows to learn more about methods and tools that might support their research. Invited are fellows from all the different research fields in KSETA, from theoretical or experimental particle physicists to software- or cryo-engineers, to spend three interesting and inspiring days together and have the chance to benefit from other's experience. In groups, the participants are asked to prepare a tutorial "from doctoral fellows for doctoral fellows" on a topic that could be useful to others outside of their own field of research, such as introductions to useful tools, basic technologies for non-engineers, basics in physics for non-physicists or methods for research. 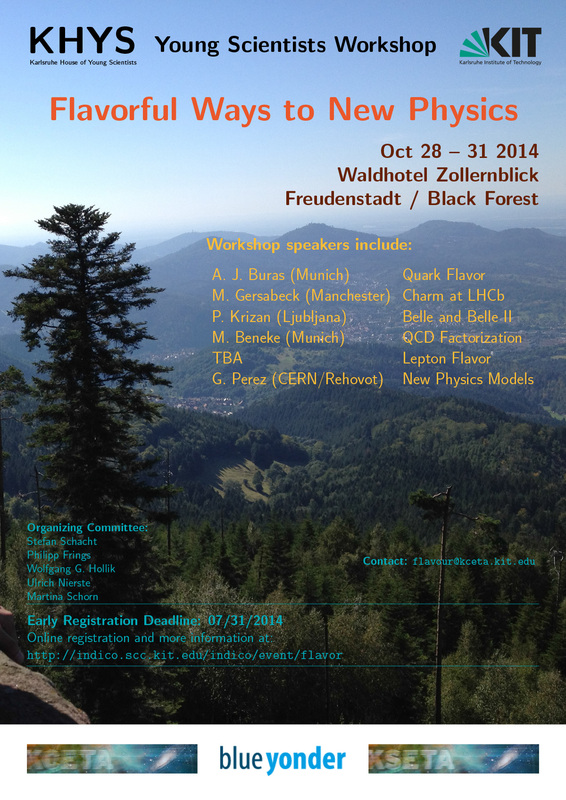 The workshop is rounded up by invited talks and discussions. 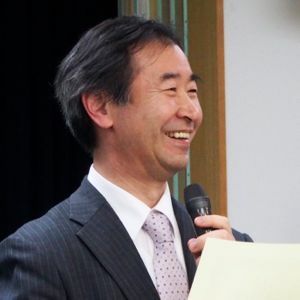 Prof. Takaaki Kajita (ICRR Tokyo), Julius Wess Awardee 2013, gave two lectures on the studies of atmospheric neutrinos on July 10 and 11, 2014 at KIT. The lectures took place in the mornings at KIT campus south and were followed by informal discussion sessions in the afternoons. The first lecture covered a review of the studies of atmospheric neutrinos until the discovery of atmospheric neutrino oscillations in 1998. On the second day Prof. Kajita presented various studies of atmospheric neutrinos that have been carried out so far and discussed future investigations. 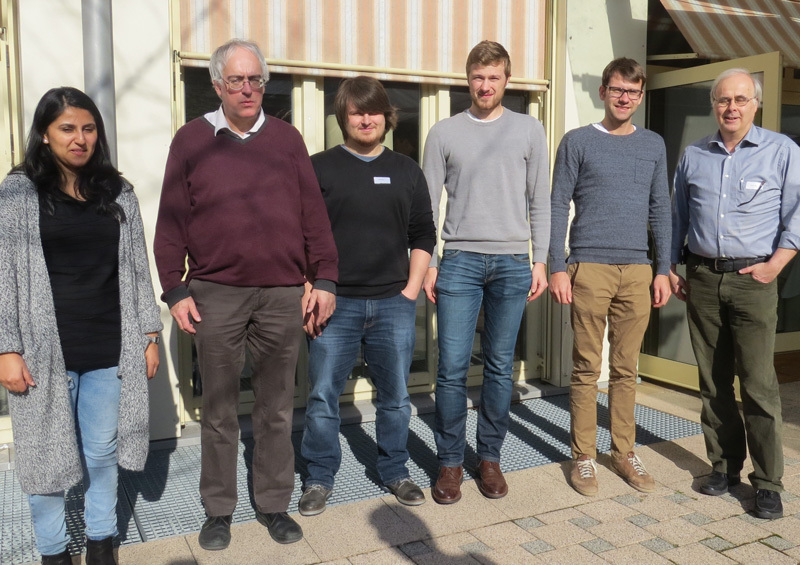 In the week of March 31 – April 4, 2014, the CMS collaboration met at Karlsruhe Institute für Technologie, KIT. With the goal of expanding the physics reach of its experiments, the Large Hadron Collider in its Phase 2 will be upgraded to reach an instantaneous luminosity that is an order of magnitude higher than what will be achieved in the upcoming runs from 2015 onwards. In order to exploit the full power of the accelerator and to survive the hostile high radiation environment as well as to meet the challenge of reconstructing the more than 100 interactions that will occur at each bunch crossing, the detectors at the LHC need to undergo an extensive upgrade programme. 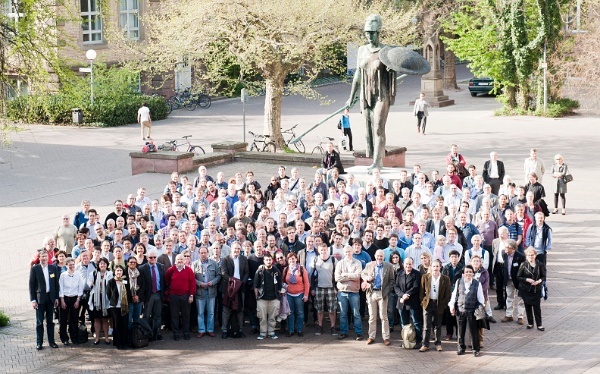 At this collaboration meeting in Karlsruhe, which was organised by long-term CMS member Institute for Experimental Particle Physics (ETP), 264 experts from the CMS collaboration from 80 institutes all over the world congregated to exchange ideas and to plan the ambitious upgrade of the detector. The five day conference was focused on the preparation of a Technical Proposal to be submitted to the LHCC at its September session. With 130 presentations in plenary and parallel sessions, accompanied by eight management meetings, the CMS week provided a unique opportunity to review the motivations for the proposed upgrades and to consolidate the organization of the R&D programs. 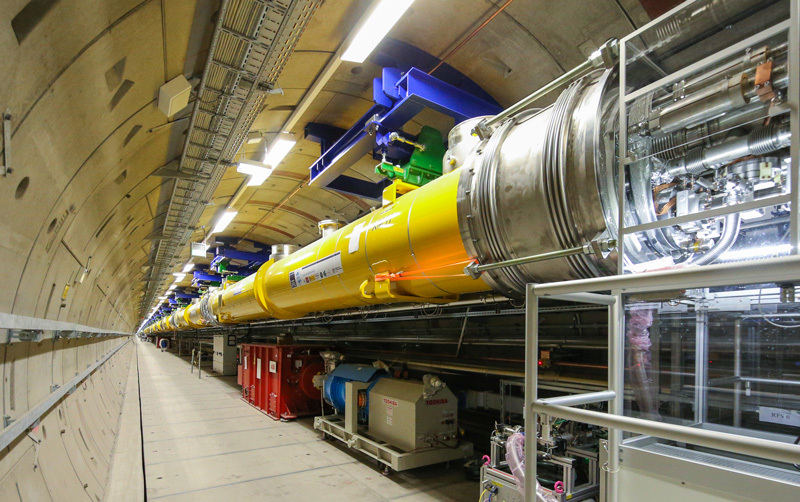 The engagement of the collaboration has recently escalated and tremendous progress was reported, demonstrating all the strength of the CMS upgrade program to fully exploit the HL-LHC in its most challenging physics potential. The new light Tracker, with selective read-out at 40 MHz for the purpose of enabling a hardware trigger, and the extension of coverage in the forward region, in conjunction with a high resolution and fine granularity endcap calorimetry, in order to discern Vector Boson Fusion or Scattering processes, are among the major innovations foreseen for the future detector. Many new ideas to provide enhanced background reductions, mitigate the effect of pile-up and improvements in the acceptance to various physics signals were also discussed. 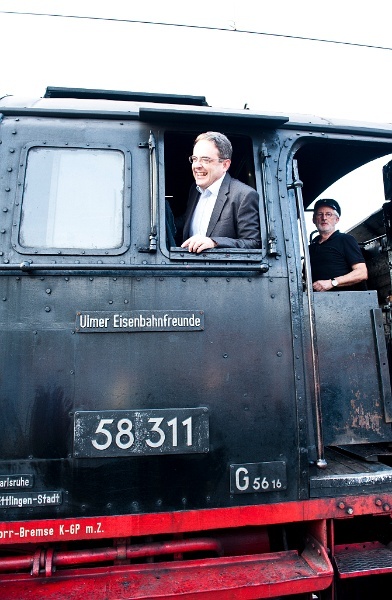 To take a break from these intense discussions and the long meeting days, the collaboration took a trip into the past by riding on a 90 year-old steam train into the Black Forest. 30 km south of Karlsruhe, the small spa town of Bad Herrenalb (home town of the organiser of the CMS Week, Thomas Muller) welcomed the visitors with a traditional Schwarzwaldabend. 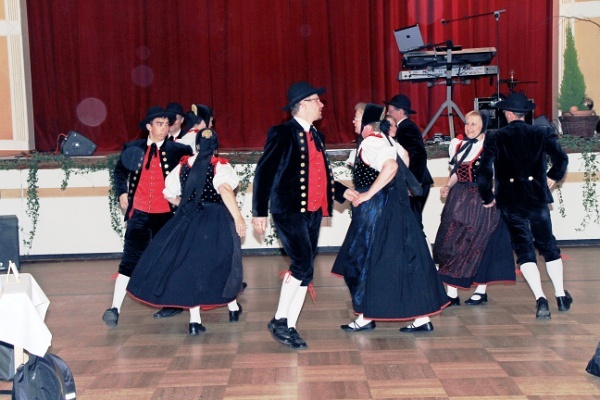 Accompanied by regional food, the participants enjoyed presentations by the local Hornblowers and traditional dancers. Another highlight of this evening was the award of a CMS model that was laser-engraved into a crystal to Simon Weingarten from RWTH Aachen for the best poster presented at the meeting. Many more pictures on the ETP-Website. With very interesting lectures by external speakers, the first plenary workshop of KSETA gave an overview of all research areas of the graduate school. 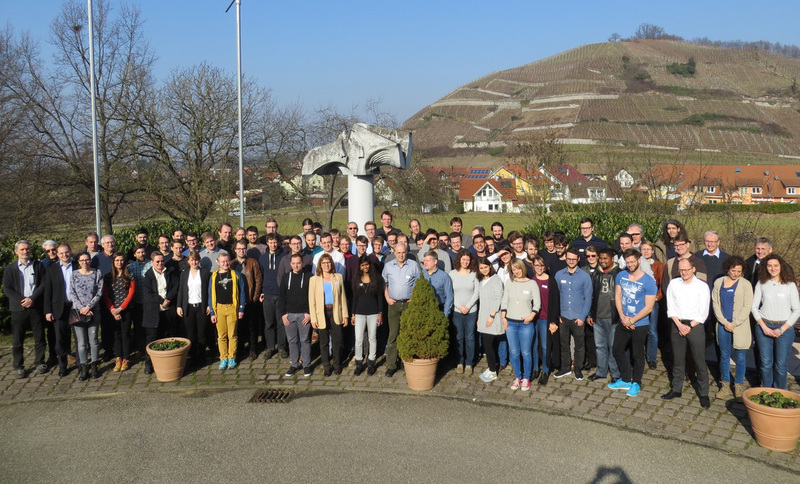 From 24 to 26 February 2014, this event in Bad Herrenalb, in which almost all members of KSETA participated with 142 participants, offered a platform for exchange between doctoral students and the KSETA Principal Investigators. The programme was complemented by many excellent lectures by committed young scientists, doctoral students and postdocs from KSETA. They presented a colourful round of current research work and showed their skills in professional presentations. Getting to know each other and growing together as a group was supported with an exciting evening event consisting of entertaining games and a successful fondue evening. In small working groups, the participants dealt with questions about the graduate school in general, including expectations of and offers from KSETA. The sometimes very interesting results of the discussion will of course be implemented with the active support of all participants to improve KSETA.